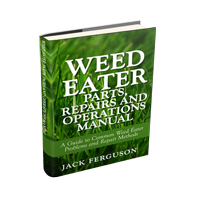 A carburetor overhaul and rebuild may be required when you have owned and used your favourite weedeater featherlite for some time. 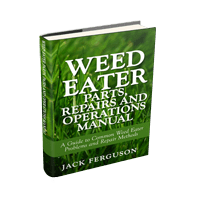 Weed wacker carbs contain a number of replacement parts including fuel diaphragms, gaskets, metering needle, primer bulb, fuel lines and filter. The carburetor is a critical part of the weedeater engine and is necessary for providing the correct fuel and air mixture to the engine based on your throttle movements. Unfortunately it is cheaper to buy a new weedeater featherlite then sending your existing trimmer to an engine repair shop to complete this overhaul. However it is far cheaper if you can follow the two part instructions below and conduct the carburetor rebuild and overhaul yourself. Remove the two allen screws on the filter cover. Remove filter and filter holding plate. Remove air filter housing from carburetor by unscrewing the bolts. Remove the carburetor from the engine. Remove the carburetor cover by removing the screw. Pull off the fuel diaphragm gasket. Turn the carburetor over and remove the primer bulb by unscrewing the 4 screws. Remove the other carburetor cover and pull off the metering diapragm gasket. Check the condition of all the diaphragm gaskets. If a diaphragm gasket is stiff, holed or cracked it will need replacing. It is good practice to replace the diaphragm gaskets every time you overhaul and rebuild your carburetor. Remove the fuel metering needle, metering lever and spring by unscrewing the backing plate bolts. Check the condition of the fuel metering needle. If the tip shows signs of wear or discolouration then it will need to be replaced. Remove the backing plate gasket. Remove both HI and LO fuel adjustment screws. Using carb cleaner spray the solvent on the carburetor parts including all holes and surfaces. Using a wire brush softly clean all the gasket surfaces on the carburetor ensuring to stroke the brush in the direction away from the carburtor. This ensures no material enters the carburetor. Leave the carburetor parts to soak in the carb cleaner for a few hours. After leaving for a few hours give the carb parts another final spray of the carb cleaner. Need Carburetor and Fuel Line Parts? Purchase a carburetor kit suitable for your model. Normally two types of kits exist where one kit contains the diaphragm gaskets only and the second kit contains all replacement parts for the carb including the diaphragm gaskets. Refit the metering lever, metering needle and spring. Refit the screw to ensure that the metering assembly is in place. Refit the backing plate and gasket by inserting the screws. The metering lever should be fitted such that it is flush with the backing plate. Use the metering level tool if required to set the height. Refit the primer bulb end plate. The end cap fits only one way so do not be concerned about fitting it incorrectly. Refit the primer bulb by inserting the 4 screws. Check the primer bulb is not holed. Turn the carburetor over and refit the gasket and diagraph. Refit the end plate. Hold back the throttle mechanism to allow this plate to be refitted. Refit the HI and LO fuel adjusting screws. Refit the carburetor to the engine by inserting the filter housing bolts through the carburetor. Refit the filter and filter holding plate. Follow the instruction to prime, startup and adjust the carburetor.